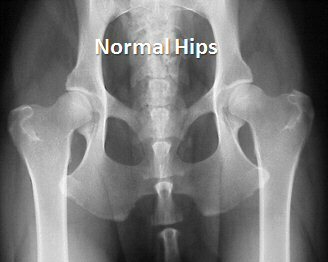 Radiographs are necessary to confirm the diagnosis of hip dysplasia. The genetic background should be examined if it is available. Nutrition (volume and composition) can aggravate hip dysplasia by increasing the Body Condition Score (excessive body weight for the skeletal size of the animal). The duration of symptoms should be determined as well as the progression and severity of symptoms. Activity levels (frequency and duration) should be known as well as the surface conditions upon which the dog spends most of its time. If any medications or other treatments have been given, the duration and response (or lack of response) is important information. The orthopedic exam begins with observation of posture and ambulation. Palpation of all 4 limbs is performed focusing on each long bone, the major joints, muscle mass, the spine, and the supporting soft tissues. The hip joints are generally examined last in order to better rule out other orthopedic origin pain before eliciting hip joint pain. Hip extension is resisted if hip pain is present in calm dogs.Excited dogs occasionally need more than one examination over a period of about 1 hour to complete the examination with a high degree of accuracy. Sedation is often necessary to acquire perfectly positioned radiographs that are so vitally important in making an accurate diagnosis. Excessive joint laxity can be palpated (Ortolani sign) if dogs do not resist joint manipulation. An Ortolani sign is helpful when “grading” young dogs with hip dysplasia. Mild laxity is normal in young puppies (up to about 8-10 weeks of age). 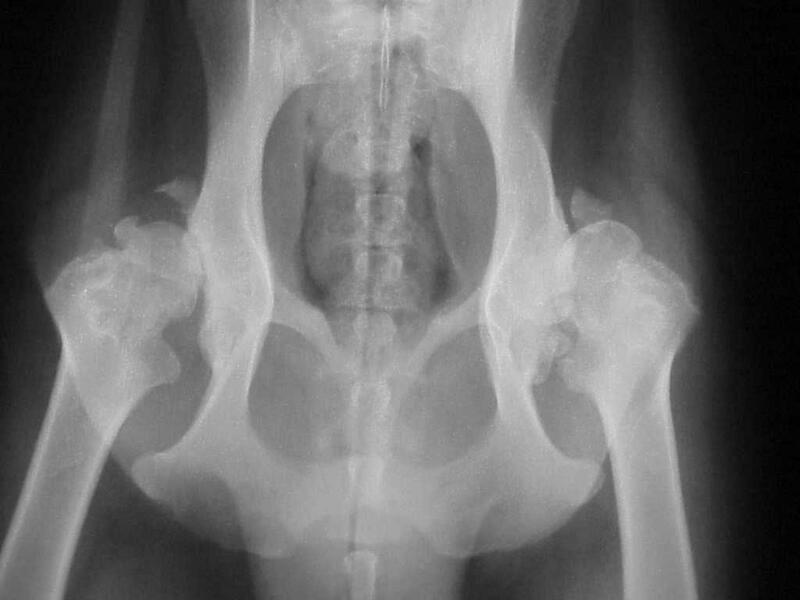 The presence of an Ortolani sign in dogs older than 6 months of age is abnormal and diagnostic for hip dysplasia that is confirmed with radiographs. 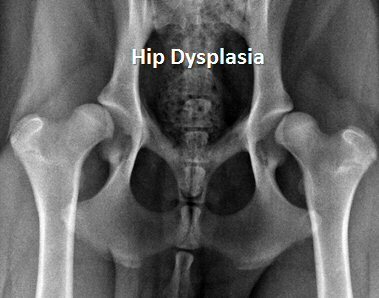 Confirmation of the diagnosis of hip dysplasia requires radiographs. Dog may be excited and/or painful during hip extension while positioning for image capture. Chemical restraint (sedation or light anesthesia) is usually recommended to obtain perfectly positioned radiographs with minimal X-ray exposure. 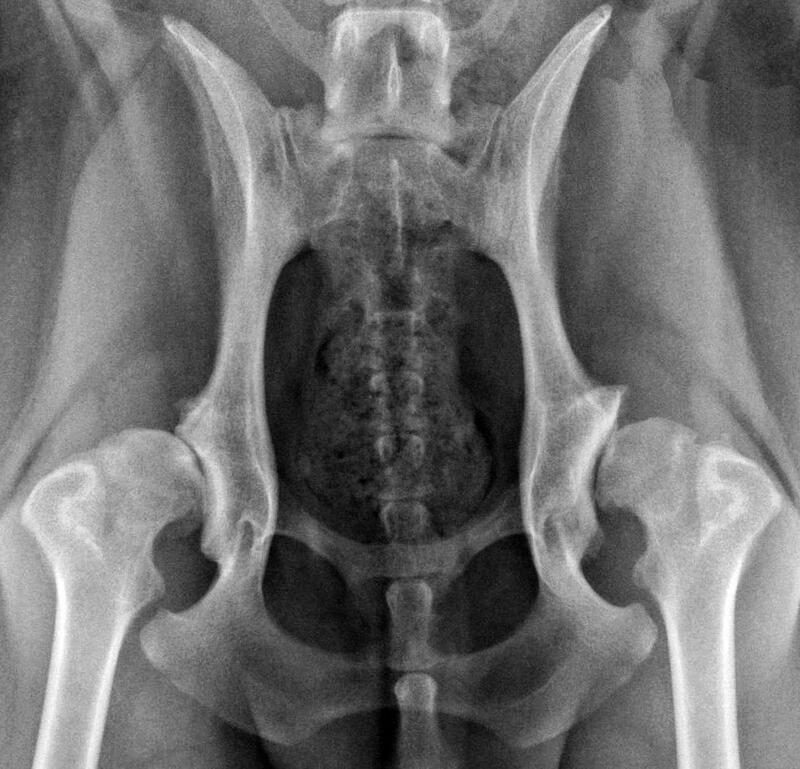 Two views, a ventral-dorsal and a lateral radiograph, of the pelvis are usually adequate to diagnose hip dysplasia. The ventral-dorsal view should be in “OFA position”. The lateral view should have the hemipelvii perfectly superimposed, the femurs should not be superimposed, the distal femora on the 2 sides should show separately with the condyles superimposed on both sides, and the most affected femur should be positioned further caudally than the other side. 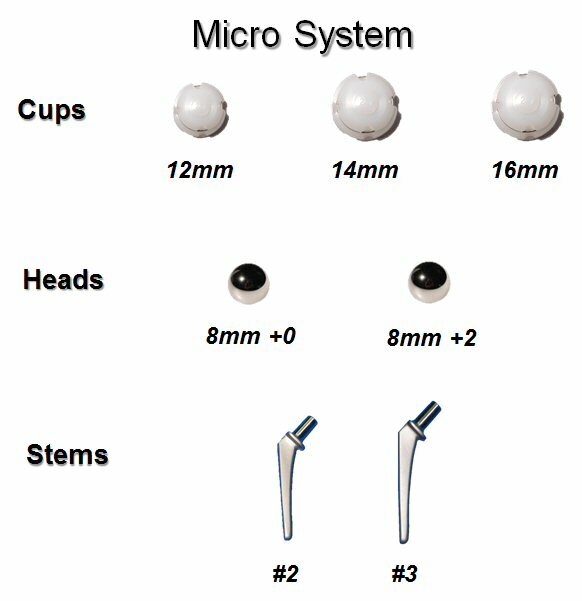 A 100mm magnification marker should be part of the image, placed perfectly parallel to the receiver plate, and placed at the height of the hip joint. The femoral head (ball) is not seated deeply in the acetabulum (socket). About 50% of the head should be superimposed inside of the acetabulum. Joint incongruity (surfaces that should be in close contact) is not present. Other causes of the lameness must be ruled out. 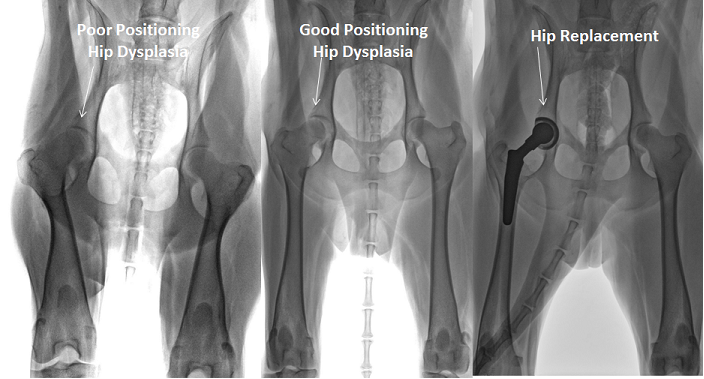 Even if hip dysplasia is present, critical evaluation of high resolution well positioned radiographs may reveal concurrent problems. Both hips must be evaluated. The views produced can be dramatically different if positioning is incorrect. This can lead to over or under-interpretation of the images. The severity (mild, moderate, severe) of the laxity and the arthritis must be determined. 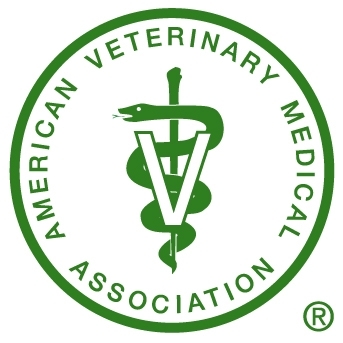 The combination of both the clinical and the radiographic findings are importance when making treatment recommendations best for the life of the animal. 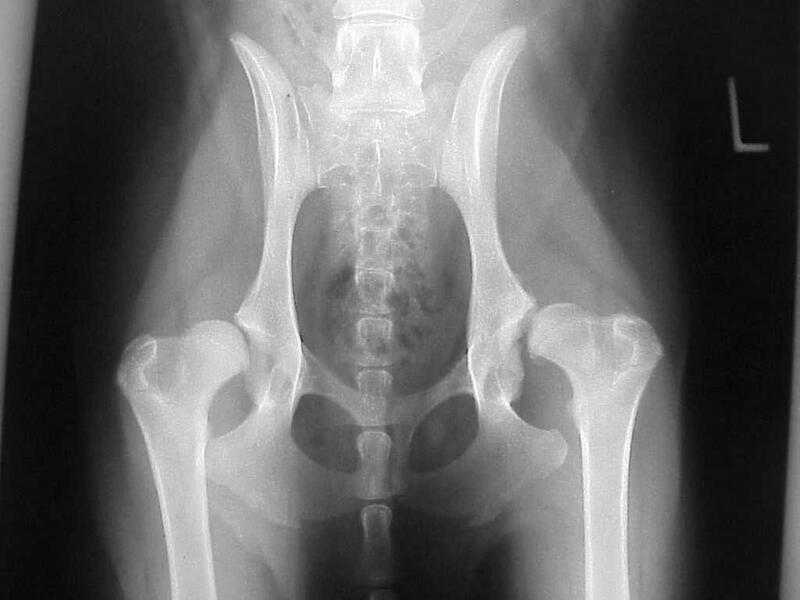 Radiographic techniques, such as PennHIP®, are utilized to establish the probability of young dogs developing hip dysplasia in the future. The PennHip® technique can demonstrate hip laxity suggestive of hip dysplasia at an early age. This is helpful for breeding purposes, but does not necessarily contribute to decision making in mature dogs’ treatment of hip dysplasia.